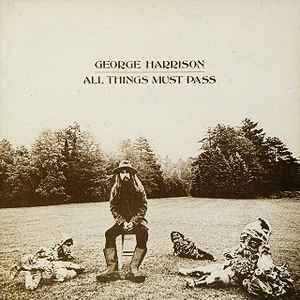 All Things Must Pass is a triple album by George Harrison. Recorded and released in 1970, the album was Harrison's first solo work since the break-up of The Beatles in April that year. The original vinyl release featured two LPs of rock songs as well as Apple Jam, a third disc of informal jams. Often credited as rock's first triple album, it was in fact the first by a single act, the multi-artist Woodstock live set having preceded it by six months. In regards to the album's size, Harrison stated: "I didn't have many tunes on Beatles records, so doing an album like All Things Must Pass was like going to the bathroom and letting it out. The album was critically acclaimed and, with long stays at number 1 in both the US and the UK, commercially successful. It was certified 6x platinum by the Recording Industry Association of America in 2001. I sold my OG US copy after listening to this a few times. It is fantastic! Those matrix numbers (posted by 3pennyOprah June 26, 2018) are on my copy, too. I can't believe that there is a copy having none. There are 7000 copies for this Record Store Day version actually. Yep. This was the original version distributed by EMI Malaysia. A later version was issued in a box with just LPs in polythene sleeves and no lyrics. How can Dhani Harrison be on this if he was born 8 years after it was recorded? Is this some crazy Krishna reincarnation trick? Couple things I found about the packaging when comparing to the US and UK editions -- the box is slightly larger (maybe about 1/3 inch length and width). The binding that holds the box together appears to be thicker material and is much stronger. Most US copies I see have a binding that has split, but I could see this one lasting a long time. incredible pressings. Definitely better than my 1st US copy. So much detail, but also sounds very smooth, warm, and cosy. Quiet vinyl. Considerably less compressed sounding compared to my original press. Also, less distortion in the vocals on the louder tracks like Wah-Wah (which sounded especially poor on my clean original copy) Packaging is top-notch and the print quality looks much better than my original. All around a better version of the LP than what I'm used to! Highly recommended! By the way, perfect music as well. There are several things that stand out for me on this release, some more comfortably than others. The first is that Bob Dylan co-wrote at least two tracks on this massive release while Harrison was in Woodstock, “I’d Have You Anytime” and “If Not For You,” which was an actual Dylan song. The other aspect is that the album was co-produced by Phil Spector, employing his ‘Wall Of Sound’ technique that did allow this massive opus to soar to astonishing heights, but only in certain places, at other times it is all so unnecessary. Harrison was supposed to have been a spiritual man on a spiritual quest, yet he seemed forever unable to employ those values, divest himself from worldly possessions such as expensive cars, drugs and jabs at his former bandmates [other than Ringo, and who can’t love Ringo?] … though religious people will immediately say that he was just a man with human flaws, and could be forgiven. That being said, the album certainly reveals how many of the great Beatle songs had been penned by Harrison. Nevertheless, we find Harrison, like Lennon and McCartney pointing fingers, stamping feet, fussing and fighting over money and control, control not just of who The Beatles were and what they’d done, but squabbling control over each other through pointed songs in a rather messy divorce; and still, Harrison could not take the higher ground. With that in mind, if you take the time to look back over the catalog of The Beatles, it’s interesting to note that Harrison never shied away from writing pointed angry negative material, just consider “Taxman” or “Think For Yourself,” where Harrison cuts to the quick without remorse or hesitation. This album came out in the middle of the ‘One Way’ movement, the one way being that of god, with other musicians [including Dylan] other than Harrison attempting to find purpose in their lives through some sort of higher more spiritual power, and I feel that that aspect was entirely missed on this release, as most of the songs can be seen as having spiritual undertones, if not overtly so, and yet the album was embraced by the world as a masterpiece, by people who wouldn’t have purchased a christian [small c] or religious record of any sort, yet since this set of three 3 albums was released by a Beatle, it was shrouded in acceptance. Yes, I fully realize that I’m neglecting the music over the message, but the music is merely a vehicle for the message, and it’s the message that should ‘carry the weight’ and be explored. Certainly the music and instrumentation was splendid, and why shouldn’t it be? Consider those invited to play on this collection, then consider the bitter track “Wah Wah,” a song that was encased in so many layers of sonic guitar work that it feels like three guitars fighting each other, perhaps another Freudian reference to The Beatles infighting. And on the haunting “All Things Must Pass,” Harrison thought that he could wave off the Maharishi and his misdeeds, the notion that The Beatles even existed [Harrison kept the fact that he was one of The Beatles from his son for years], his affection for other people’s wives, and so much more, by simply repeating the mantra chorus ‘all things must pass.’ It’s interesting to note that with Harrison’s eastern spiritual ideals, that he would rework the verses from Matthew 24:6-8 for the album’s title and its implications. This is by no means a pleasant album, with that fact being missed by the great instrumentation, the country flavorings, and the rich tapestry, with the notion that this was a series of lectures, a series ‘this is what you should do,’ ‘this is what I believe,’ ideas that subliminally circumvented all that had been established by The Beatles, where Harrison attempted to come off wiser and more mature. And back to the cover art, where in its black & white state, it made a very black and white statement, why it needed to be colorized and made to feel more friendly and inviting for the reissue is simply another aspect of the subversive nature to draw listeners in, to hear Harrison’s beliefs and messages, where as good as the music is, ‘in the end’ it’s the message that counts, it’s the message that exists as the central core, it’s the message that we should concern ourselves with. The album was never recorded or pressed that well, Phil Spector was endlessly tweaking things, and it was certainly rushed out for the holiday fans, leaving substantial problems regarding the handling of the vinyl at the record plant, where the records where damaged long before they ever got to the listeners. Some pressing from other countries are far superior than others. The original UK pressing now sounds terrible on quality turntables, thin and strident, along with top end distortion and surface noise. The store returns of this record would only be matched some eight years later with he horrid pressing of The Wall by Pink Floyd. Of course, perhaps I'm being a bit too rough on Mr. Harrison, as when he was doing all is complaining and preaching, I was patching up wounded kids in Viet Nam.